The latest addition in my makeup haul: Laneige pushBUTTON Serum Intense Lipstick in P42, Retro Plum. This is one of the most popular makeup series for Summer 2014. This is a collaboration between Laneige and pushBUTTON, allowing makeup to fuse with fashion inspirations. I'm not too crazy over the Korean pop industry, but I would admit that they are really good at leading Asian trends. All the packaging has the colourful leopard prints - definitely much more interesting than normal black tubes! They make for a sprightly addition on your makeup table. The clear top cover works with a click mechanism - twist to raise the lipstick. Something I like about this lipstick is its super richness in colour. It rolls on very smoothly and is a gorgeous shade of fuschia-purple (for those who likes preciseness, it looks like #dd285b). I was impressed with its hydrating factor even without putting on any additional lip balm, you can use it on its own. It makes for a pop of colour if your outfit is mostly black. I use this lippie moderately for casual days - not smearing it on to its full capacity most of the time. 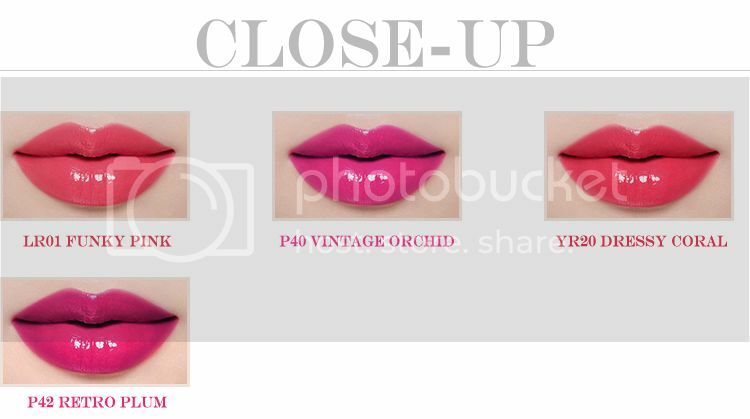 You can also try out the Korean Gradient Lips style here. The other lipstick colours in the same makeup range are: LR01 Funky Pink, P40 Vintage Orchid, and YR20 Dressy Coral.